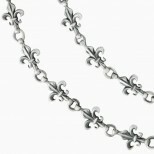 .925 Silver fleur de lis link chain with an antique blackened finish. 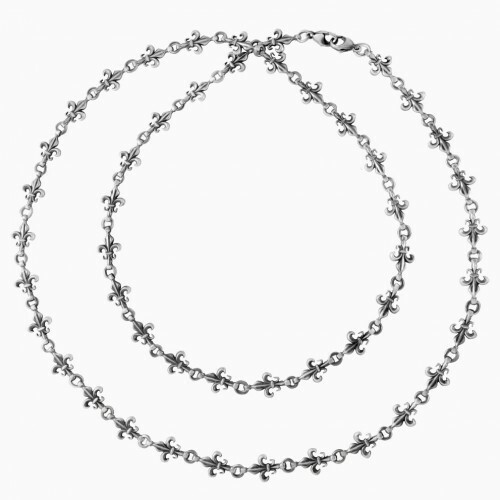 Each link is 13 mm in length and 7.5 mm wide. Total length of chain is 30 inches. The chain has two lobster claws as clasps, which allows you to play around with different lengths of the chain with a layered effect. For a special order for a different length, please contact us. The price will vary on length, this listing is for a 30 inch chain, we can make any length starting from 16 inches.